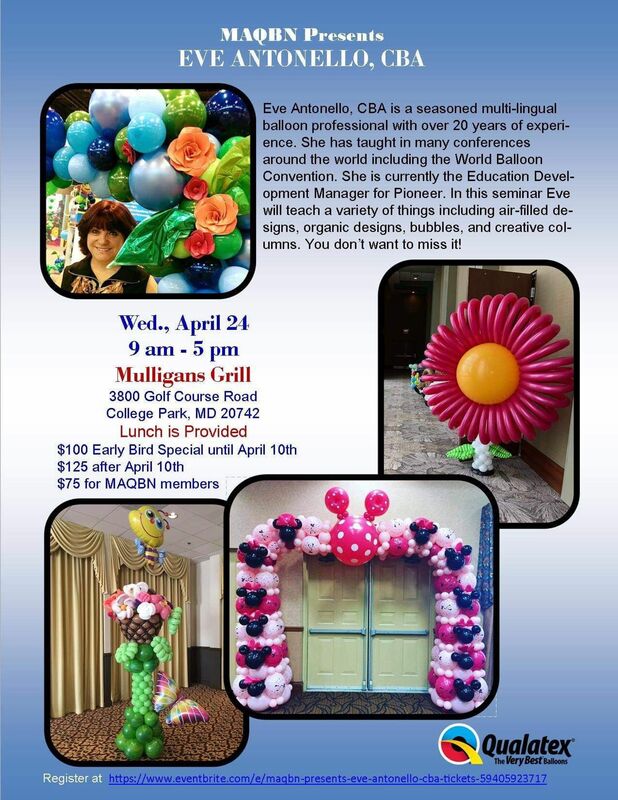 April 23, 2019, 9 a.m.–4 p.m.
April 24, 2019, 9 a.m.–5 p.m.
Join the Mid-Atlantic QBN Chapter as we welcome the Extraordinary Eve Antonello, CBA to Maryland! 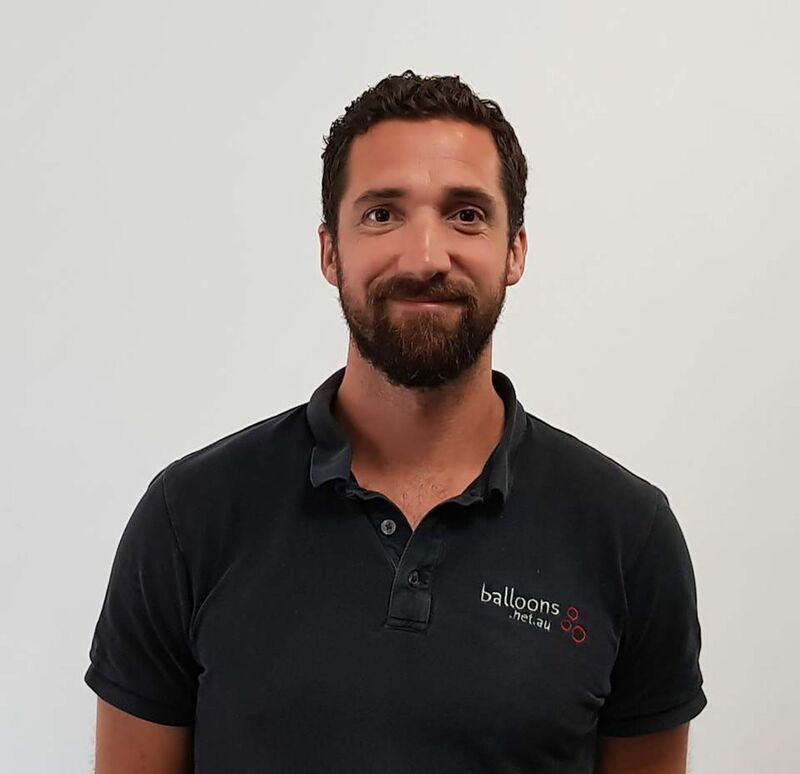 Eve Antonello, CBA is a seasoned multi-lingual balloon professional with over 20 years of experience. April 24, 2019, 9:30 a.m.–5 p.m. The day will be full of information, designs, techniques, hands-on opportunities and a chance to ask Chris questions. 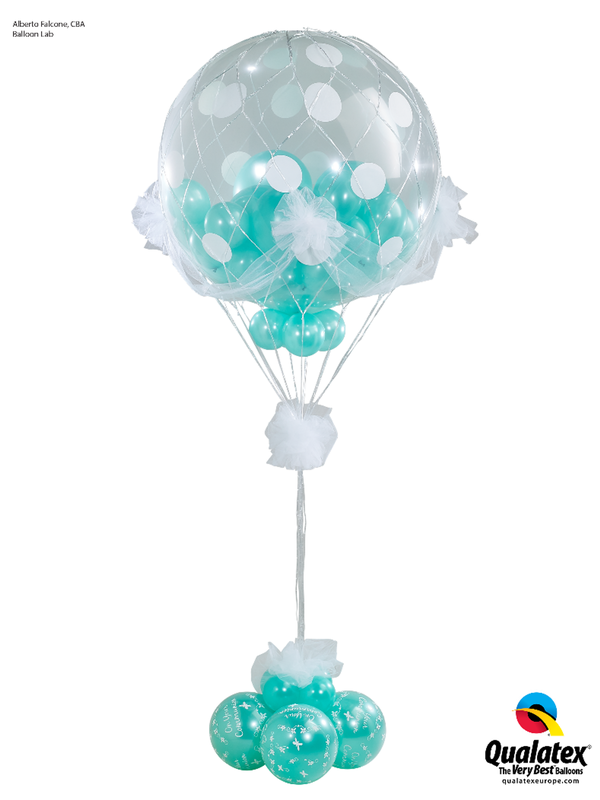 Topics included are Organic Garland, Framing, Organic Balloon Cloud and Illuminated Balloons. April 28, 2019, 9:30 a.m.–5 p.m.
April 30, 2019, 9:30 a.m.–5 p.m.
May 2, 2019, 9:30 a.m.–5 p.m.
May 8, 2019, 9:30 a.m.–5 p.m.
May 13, 2019, 9 a.m.–4 p.m.
With helium becoming more and more scarce, there is no better time than now to equip yourself with techniques for air-filled designs. 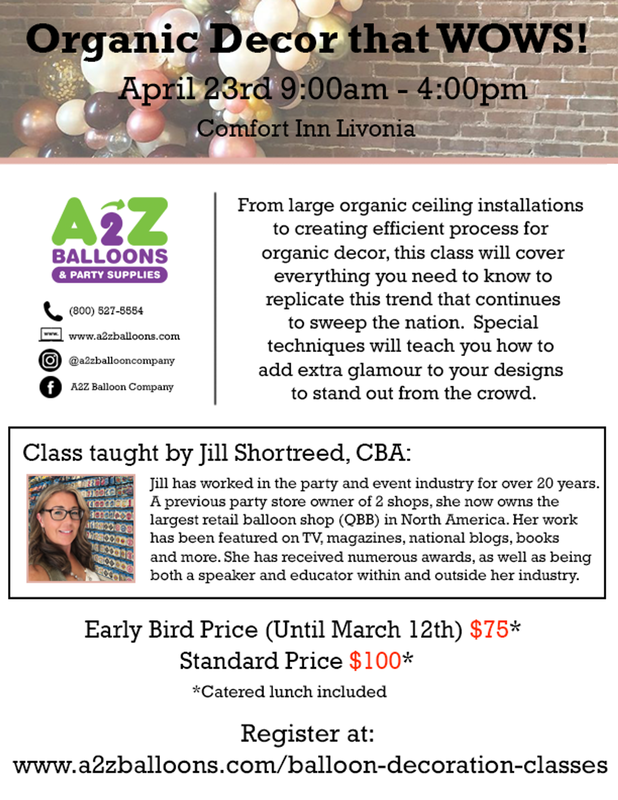 This class will demonstrate multiple disposable base styles, deliveries that incorporate trendy foil shapes with no helium, and new ideas to take your business to the next level without helium. 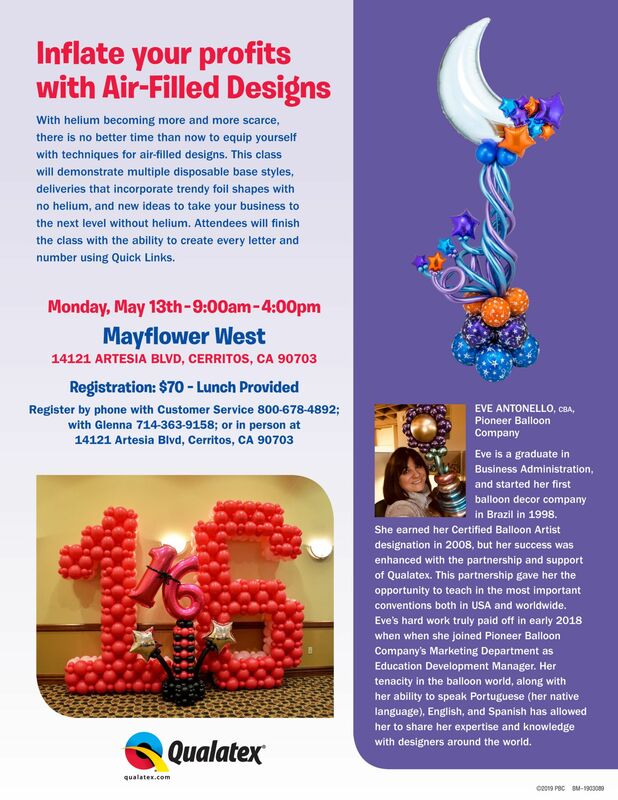 May 14, 2019, 9:30 a.m.–5 p.m.
Twisting Decor Made Easy is a fantastic introduction to Deco-Twisting, covering all the important twisting techniques. 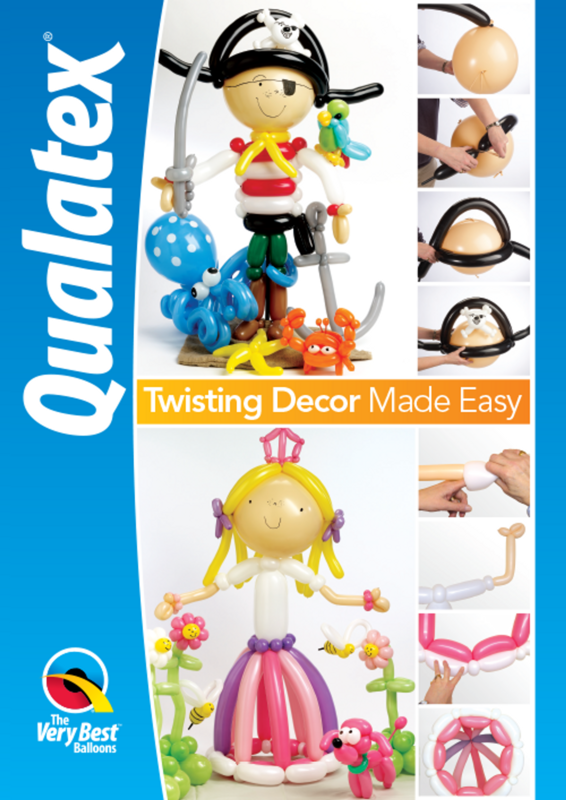 Suitable for beginners, this course is ideal for decorators or retailers and focusses on using modelling balloons to add value and interest to designs with minimal additional cost. This one-day masterclass will focus on all the important family occasions based around baby and the early years.